Look what showed up in the garden. 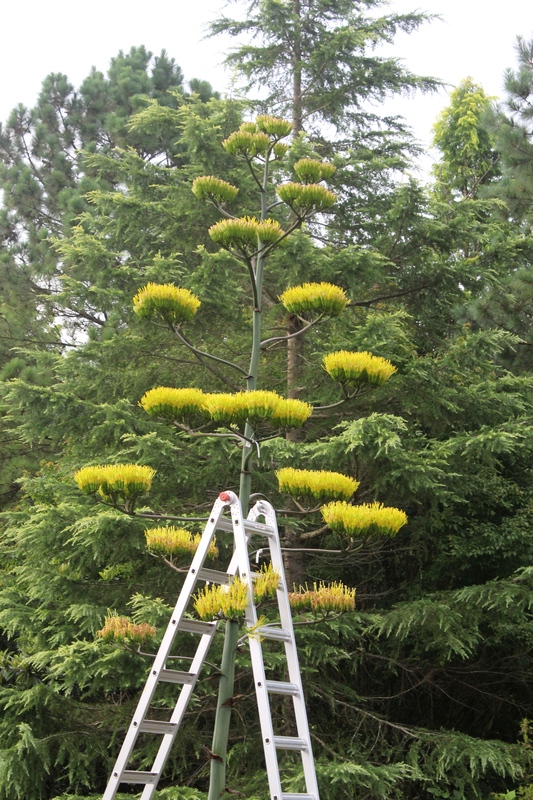 Our specimen of Agave ‘Mountain Man’…a hybrid of Agave montana and Agave gentryi decidied to flower for our spring open nursery and garden. This unusual hybrid starts its flower spike in the fall, which stops for the coldest part of winter, then starts growing again in spring. The spike showed no damage despite a winter low of 13 degrees F. Be sure to check this out when you visit…located just behind the welcome tent. It’s been absolutely amazing to watch the swarm of honeybees, ants, and hummingbirds feeding on our giant 30′ tall flowering agave. Here’s an updated photo of the blessed event from yesterday. This weekend’s final summer open house is the last chance to see it in person.